Eli Shiningheart! Is he going to meet up with Dash Gallant at any point in time? Perhaps when Dash crashlands on this primitive little planet? Awesome! I once had the opening paragraph of the Encyclopedia Brown books memorized - it was the same in every book. BTW, has peace ever settled easily on any land? Sounds pretty good. I hope to the Shining Ones that this story doesn't end up introducing a female counterpart. PS Where's the dragons? When I was young I used to read/play the Choose Your Own Adventure RPG books of "The Lone Wolf" series. Every book required this sort of recap in the beginning, and they even had a new map in each one, but most of the time you still had no clue what was going on in the story, and even if you died and had to start over, it wasn't so much about the great storyline or anything as just trying to beat the book so you can get some new skill on your character sheet. Also, JK Rowling does this to some degree. Good one, Joel. Thanks for getting all posty again. "...looked up," is just brilliant. I always imagined, while rediscovering that Harry Potter is no ordinary boy, that the editors forced her to write all that, in case there are silly people out there who start in the middle of a series or who don't recall what they've read. 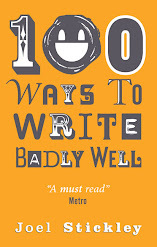 I think a key to writing badly well is assuming your readers are idiots. Most writers who write books with the same characters struggle with this - it's harder to think of writers who do it well than writers who do it badly. I think Terry Pratchett is pretty good at it, as is Douglas Adams and Dianna Wynne Jones - both writers who assume their readers have some brain, which fits in with CT's point. Then of course there's the ones who cheat, and have a "Previously on The Wheel of Time..." intro. It's the literary parallel of Lost's infamous eight-minute recap. I love it! For the love of everything holy, dear adventure authors everywhere, please figure out a better way to convey foreboding silence.